Built on the belief that what you put in and on our bodies should be derived wholly from nature, only ingredients free from toxic ingredients like synthetic preservatives, fragrances and colorants are used. These ingredients are carefully selected and sourced from all over the world, with many locally, to ensure that that they are non-GMO, sustainable and of the highest quality. 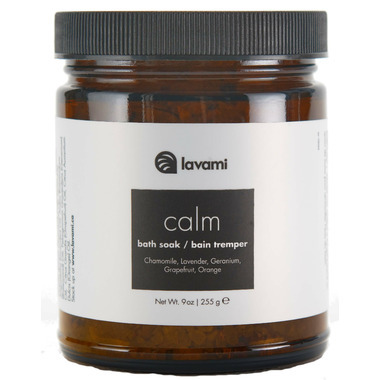 The Calm Bath soak can promote a sense of inner peace with Dead Sea & Himalayan salts, chamomile flowers, lavender buds, chamomile, lavender, rosewood, geranium,grapefruit and orange essential oils. The ingredients combine in perfect harmony to transport you away from your daily stressors, and create a space that is all your own. Instructions for Use: Add a tablespoon up to a 1/4 cup (depending on preference) to warm bath bath. Do not ingest. Store at room temperature. Ingredients: Dead Sea Salt, Himalayan Salt, Chamomile Flowers, Lavender Buds, Chamomile Oil, Lavender Oil, Rosewood Oil, Geranium Oil, Grapefruit Oil, Sweet Orange Oil.